On the question of how to make classical music more accessible I remain a seeker. There are persuasive arguments from the modernists who see the need to cleanse concerts of what they see as silly conventions. But the classicists counter these with compelling explanations of how such conventions are an integral part of the concert experience. Recent posts here have favoured the modernists, but parallel reading has led me to see the arguments of the classicists in a different light. Zen Buddhism has had a considerable impact on Western classical music. But its more esoteric cousin Tibetan Buddhism remains elusive despite its embrace by Jonathan Harvey and other composers. Buddhism warns against dualism and the possibilities offered by the non-dualistic middle way are evidenced by Jonathan Harvey's questioning so-called silly concert conventions while composing music influenced by Tibetan Buddhist rituals and the highest yoga tantra. "Transmutation, which counts as a high [Buddhist] teaching, is hard to describe, or accomplish. Heightening, intensifying, then stealing and exploiting the energy of an emotional obstacle, no matter how superficially "disturbed", is one description." Many small Tibetan monasteries are expert in performing these different [tantric] rituals, but one can question the accuracy of their knowledge of the symbolism and significance behind the movements. Also, people generally seem to think of ceremonial masked dances as entertainment, a spectacle. This is, in fact, a sad and unfortunate sign of the degeneration of the tantra. * Soundtrack - I discovered Per Nørgård's music many years ago on a now deleted Ondine release of his music for strings winningly played by Juha Kangas and the Ostrobothnian Chamber Orchestra. 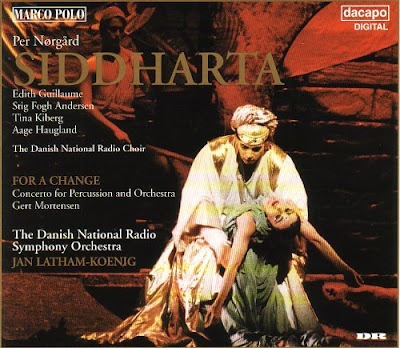 But the Danish composer's opera ballet Siddharta only came to my attention recently when I noticed a copy in Jeff Harrington's apartment in Avignon. Per Nørgård (b. 1932) is one of Scandinavia's most important living composers. Despite this his music remains little known elsewhere; surely yet another example of too much attention being lavished on too few people in classical music? In the late 1950s Per Nørgård rejected serialism as an artificial construct and instead developed his infinity series in which melodies are created by projecting intervals in a pre-determined order and extending them over ever increasing distances. In addition he uses a rhythmic system defined by the golden ratio found in the visual arts. Despite its arcane origins and uncompromising modernity Per Nørgård's music sounds surprisingly familiar at first hearing, an apparent vindication of his rejection of serialism as an artificial device. 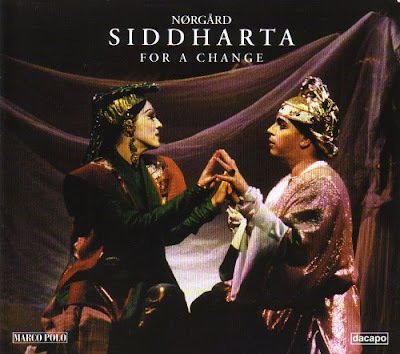 Per Nørgård does not appear be a practising Buddhist and his three act opera ballet Siddharta, which lasts for two hours, only deals with the pre-enlightenment years of the young Prince Siddharta. Composed in 1979 it has a Danish libretto by one of the country's greatest poets Ole Sarvig (1921-81). This is music that needs to be heard to be appreciated, but for those who want a quick and fallible description think Britten's Death in Venice meets Messiaen's Saint Francis. But much better try it for yourself. The excellent Danish Radio recording on Da Capo with Jan Latham-Koenig conducting the Danish National Radio Symphony Orchestra with the Wagnerian tenor Stig Fogh Andersen in the title role is seen in my two accompanying images. This 2CD set, which comes with the bous of Per Nørgård's percussion concerto For A Change, is highly recommended with good recording quality, committed performance and exemplary documentation including an essay by the composer. And above all, it shows how classical music defined by in Per Nørgård's case by mathematical as well as performance ritual, can enfranchise spiritual energy and transmute it. ** Further resources - it is impossible to do justice to Per Nørgård's soundworld in a blog post. A good starting point for further exploration is Jørgen Mortensen's website which includes a biography and an explanation of his composing system. Audio samples from Siddharta are available via the Da Capo website. *** Wagner and the tantric orchestra are here. For what it's worth . . . I once asked a lama what tantra was all about and he said it's like flooring the accelerator when driving a car, so it can be dangerous without a guru close at hand to make sure you're going in the right direction. It will get you somewhere a lot faster, but there's nothing in tantra itself which assures a good outcome. One composer who is heavily influenced by Tibetan Buddhism is the French-American minimalist Eliane Radigue. This goes further than art because I'm almost certain she is a practicing Buddhist.